This rugged case is ideal for situations where a handheld mobile computer/scanner is being used outside. These environments may include Transportation, Resource Industries or Utility Companies. This case is designed using System Wear’s unique, custom made high-density foam material. This rugged case features a shoulder strap, rear zipper, security hand-strap and front and sides of case are lined with thick water-resistant plastic. The case has clear plastic windows and is weather resistant. Suitable for outdoor environments where rain or snow is a concern. Case attaches to a clip that is worn on the belt. Clip offers swivel capabilities, allowing the user to move the case in different directions while being worn. Comfort of case ensures that the scanner is kept on the employee, thereby preventing loss and damage to the device. 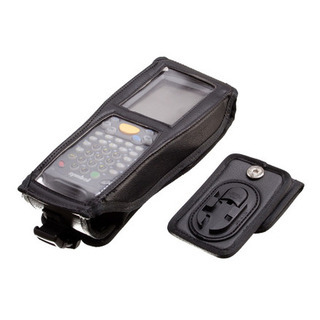 Can be designed to accommodate Bluetooth and swipe card attachments.